The energy needed to damage most electronic devices[specify] is between 2 and 1000 nanojoules. ^ Dhogal (1986). Basic Electrical Engineering, Volume 1. Tata McGraw-Hill. p. 41. ISBN 978-0-07-451586-0. ^ "Ionizers and Static Eliminators". GlobalSpec. 2009. Archived from the original on 2009-02-10. Retrieved 2009-04-13. ^ "Fabric Softener and Static". Ask a Scientist, General Science Archive. US Department of Energy. 2003. Retrieved 2009-04-13. ^ Antistatic Bags for Parts. PC Chop Shop. John Wiley and Sons. 2004. ISBN 978-0-7821-4360-7. Retrieved 2009-04-13. ^ Antistatic Wrist Strap. PC Chop Shop. John Wiley and Sons. 2004. ISBN 978-0-7821-4360-7. Retrieved 2009-04-13. ^ "Safetoes: Safety Footwear". Safetoes. Trojan Tooling. 2004. Retrieved 2009-04-13. ^ J. J. Lowke (1992). "Theory of electrical breakdown in air". Journal of Physics D: Applied Physics. 25 (2): 202–210. Bibcode:1992JPhD...25..202L. doi:10.1088/0022-3727/25/2/012. ^ Kassebaum, J. H. & Kocken, R. A. (1995). "Controlling Static Electricity in Hazardous (Classified) Locations". Petroleum and Chemical Industry 42nd Annual Conference Papers: 105–113. doi:10.1109/PCICON.1995.523945. ISBN 0-7803-2909-0. ^ Downie, Neil A., Exploding Disk Cannons, Slimemobiles and 32 Other Projects for Saturday Science (Johns Hopkins University Press (2006), ISBN 978-0-8018-8506-8, chapter 33, pages 259-266 "Electric Sand"
^ Hearn, Graham (1998). "Static electricity: concern in the pharmaceutical industry?". Pharmaceutical Science & Technology Today. 1 (7): 286–287. doi:10.1016/S1461-5347(98)00078-9. ^ Egorov, V.N. (1970). "Electrification of petroleum fuels" (PDF). Khimiya i Tekhnologiya Topliv i Masel. 4: 20–25. ^ Touchard, Gérard (2001). "Flow electrification of liquids". Journal of Electrostatics. 51-52: 440. doi:10.1016/S0304-3886(01)00081-X. ^ "CarCare – Auto Clinic" Popular Mechanics, April 2003, p. 163. ^ "NASA – Crackling Planets". Retrieved 2008-01-20. ^ Nomograms for capacitive electrostatic discharge risk assessment. Ece.rochester.edu. Retrieved on 2010-02-08. ^ "High voltage safety: VandeGraaff Electrostatic Generator". amasci.com. Retrieved 2010-01-27. ^ Index. Wolfsonelectrostatics.com. Retrieved on 2011-03-17. ^ M. A. Kelly, G. E. Servais, T. V. Pfaffenbach An Investigation of Human Body Electrostatic Discharge, ISTFA ’93: The 19th International Symposium for Testing & Failure Analysis, Los Angeles, California, USA/15–19 November 1993. ^ "ESD Terms". eed.gsfc.nasa.gov. Retrieved 2010-01-27. 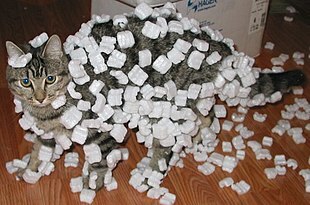 ^ Static Electricity Guidance for Plant Engineers. Graham Hearn – Wolfson Electrostatics, University of Southampton.